The following article is part 1 of a 5-part series examining 49ers quarterback Jimmy Garoppolo. Part 1 will focus on Garoppolo's accuracy. The 49ers shocked the NFL world in late October 2017 by trading one of their two 2nd-round draft picks for former New England Patriots back-up quarterback Jimmy Garoppolo. The trade shocked both fan bases, and there was some turmoil in particular in New England leading up to the trade, as noted by ESPN's Seth Wickersham. Garoppolo was a quarterback that the 49ers tried to trade for back in the offseason but it never materialized. After sitting for two games and over the bye week in week 11, Garoppolo entered his first game as a 49er on the final drive against the Seattle Seahawks for an injured C.J. Beathard, completing two passes and throwing a touchdown. Those two passes provided a glimpse into what the 49ers and their fans could expect over the course of the next five games. Garoppolo finished the season 120-of-178, completing 67% of his attempts for 1560 passing yards, 7 touchdowns, and 5 interceptions. He finished as Pro Football Focus' 10th-best quarterback on the season with a player grade of 85.2. A little over a month after the season ended, the 49ers signed Garoppolo to a long-term contract. It's easy to see why. One thing that stands out right away when watching Garoppolo is his accuracy as a passer. For the season, PFF graded Garoppolo with a 74% accuracy rating, and if he had enough qualifying snaps, this would've been good enough for 11th overall in the NFL. It's important to note that accuracy of a pass is different from completion percentage, as a pass can be accurate and still be incomplete due to a drop. To determine if a pass is accurate, a range of factors must be considered. Passes that are behind a receiver aren't necessarily inaccurate if the ball is placed away from where the defender can make a play. The film shows several instances of Garoppolo showing great command of ball placement this season. In his first appearance in a 49ers uniform, Garoppolo came in for Beathard late in the 4th quarter of the game against Seattle. After a 4-yard rush to get them inside the red zone, he completed a pass to Aldrick Robinson for 8 yards before tossing a touchdown pass to Louis Murphy on the game's final play. The play was quintessential Garoppolo from the moment the snap occurred and would be something he would do regularly over the next 5 games. The Seahawks are aligned in a "Red 2" defense, a common pass defense in the red zone. Once the ball moves into the red zone, the basic Tampa 2 defense turns into Red 2 defense with the safeties and corners adjusting their technique to account for the short field and reduced throwing lanes. The 49ers are running what would be the first of many plays incorporated into Shanahan's playbook from the Patriots passing game: the "D-slant" concept. At the snap, the pocket collapses to his right. As he feels this pressure, he sets and resets his feet looking for a throw. Eventually he escapes left and finds Murphy bracketed by 3 Seahawks defenders. Garoppolo makes this play happen by staying square to his target and fitting the ball into a tight window in double coverage. He skillfully puts it where only Murphy can go up and get it, up and away just out of reach of the defender. Throughout the remainder of the season, Garoppolo would make several throws that showed his command of ball placement in tight windows, against the blitz, and in key clutch/pressure situations as we'll see over the next series of articles, including this one. He still made some off-target throws that pushed him just outside the top 10 in accuracy but that should improve with a full off-season to prepare as he works on timing with his teammates, and that will be the subject of a later article. For now, let's look at some other throws that demonstrate his excellent accuracy. In his first start against the Bears, Garoppolo showed immediately how well he understands defender leverage and where to place the ball in relation to the route concept to give his receiver an opportunity to make an easy catch. On this throw to Goodwin on a deep curl route, Garoppolo places the ball on his outside shoulder as the defensive back has leverage inside over the top. The ball is thrown to a spot before Goodwin comes out of his break and leads him away from danger. On this next throw, Garoppolo's vision and anticipation allow him to see and anticipate tight-window throws, showing that he not only trusts where his receivers are going to be within the timing of the play, but also that he is progressing further along in his development in Shanahan's playbook. 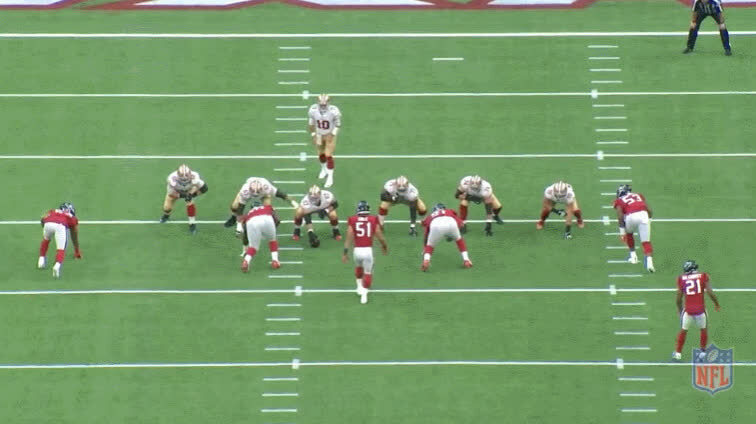 The 49ers are running the "Yankee concept" with Goodwin running the deep cross right into the heart of the Bears' cover 2 zone occupied by the linebacker. The 49ers are running play-action, but linebacker Danny Trevathan (#59) hardly bites on it as he is in prime position to defend the pass. The deep safeties immediately take away the deep post route. Garoppolo knows that he won't be able to wait for Goodwin to clear Trevathan's zone due to the safety (#39) coming across to close the gap, so he instead flicks it over Trevathan's outstretched arm and to Goodwin on the run for a gain of 20. 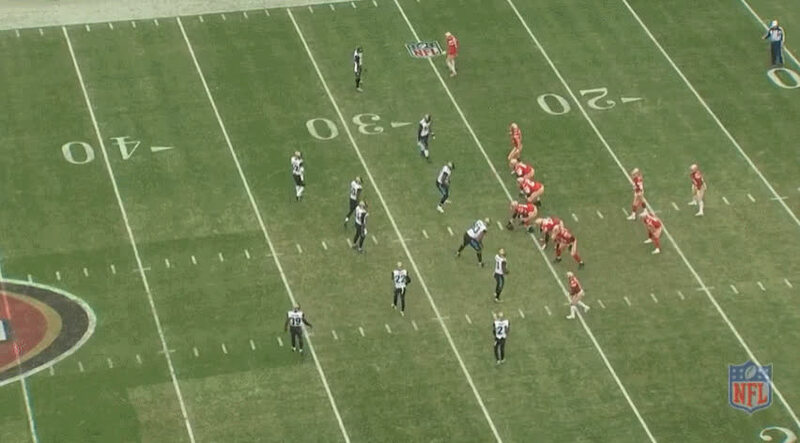 On this play, the 49ers are running a double slant concept out of an empty formation. It's a pass that appears to be behind receiver Trent Taylor, but some passes that at first appear off target are often not graded as such due to the position of the defenders. It is in fact a skillful placement between two defenders that allows the receiver to protect himself, showing that Garoppolo understands defender leverage on certain route concepts. Garoppolo purposely throws this slant route slightly behind Trent Taylor so he can protect himself from the inside defender, but still far enough in front of him that the trailing defensive back could not make a play on it. His best throw against the Texans came from the inside of a phone booth with defenders and offensive linemen in his lap. The 49ers line up in a 3x2 empty set with the 2 receiver side running the "levels" concept, a two-man progression read. The outside receiver runs up 5 yards and cuts in while the inside slot receiver (Goodwin) runs up to the 12-15 yard range and cuts in. The play is a staple Patriots passing concept that Shanahan incorporated into his playbook to ease Garoppolo into the system. You can see by the pre-snap where the void in the defense is created, and Garoppolo knows this right away, yet at the snap, he still looks off the defense to give Goodwin time to clear the inside defender before resetting and firing a bullet to him across the middle for a 20-yard gain as the pocket collapses around him. 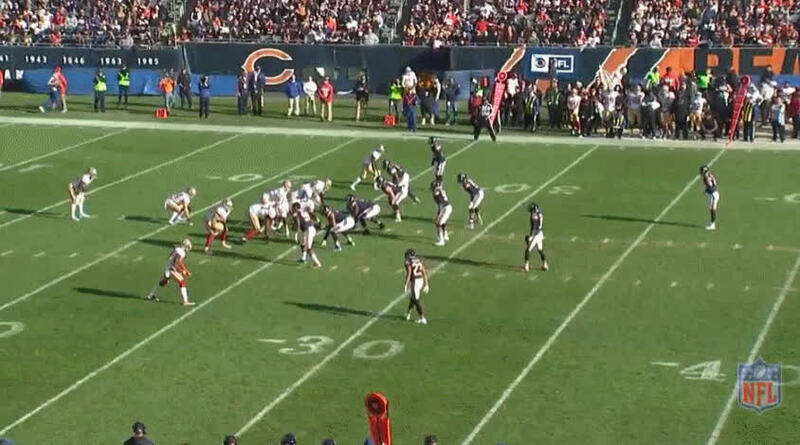 It's a remarkable throw in that he was able to look off the defense, reset, and throw on schedule to a spot where he knew Goodwin would be located without first having to spot him and then throw. Trust like that takes time to build and the fact that Garoppolo has it already is a good sign. It wasn't always easy with Goodwin though, who suffered from a ton of drops early on this season, and this play was no exception. Although Garoppolo did struggle with deep passing (the subject of a later article), he did throw several that showcase his ability to hit the deep target. On this throw, Goodwin is running straight downfield. As Garoppolo drops back and climbs the pocket, he spots Goodwin behind the defender and launches one down the sideline. The pass is on target, but Goodwin makes a weird adjustment, trips, and falls as the ball hits his hands. The pass fell incomplete, but it was one that should've easily been completed. One of the things that enables Garoppolo to stay on-time and on-target is a quick release. In their signature win in week 16 against the Jaguars, Garoppolo was able to create space against the Jaguars defense utilizing a variety of motions to keep them off-balance. On this throw, the Jaguars line up in cover 3 before shifting to cover 2 with the motion men. 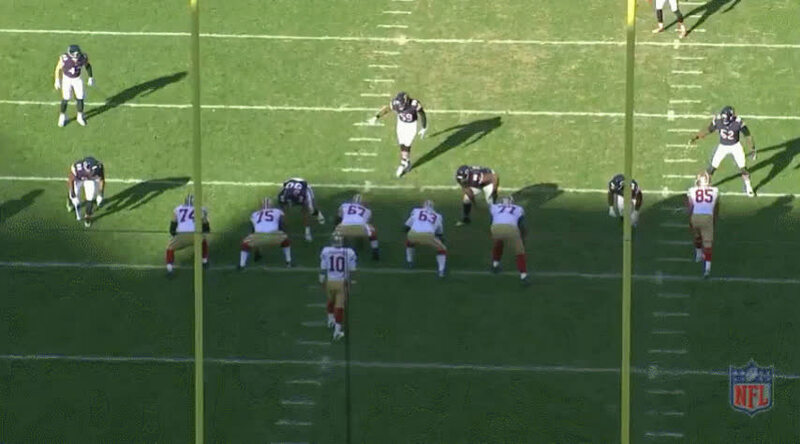 The 49ers utilize a "Y-trade" motion to create a void on the right side of the field. 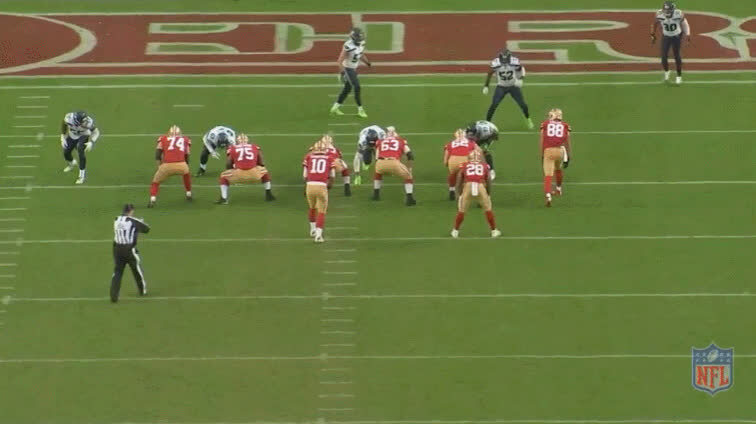 To the formation's left, the 49ers are running a "spacing concept" with a wheel out of the backfield. The void created by the motion against the Jaguars' cover 2 zone allows Garoppolo to thread a needle between the closing linebacker and trailing defensive back. If that pass is further in front, it's intercepted or tipped. If it's further behind, it's an incomplete pass or deflection and interception. Finally, against the Rams in week 17, Garoppolo again made several impactful throws on key scoring drives that showcase his precision. The 49ers are running a "flat-7" combo route concept to the formation's left. The flat-7 is a combo corner route (7 route on the route tree) and a flat route by the running back, giving the quarterback a high-low read on the flat defender. Hyde draws the attention of the flat defender, who immediately chases him, leaving Celek 1-on-1 over the top with the middle defender. The middle linebacker catches Celek underneath, but Garoppolo recognizes that he's not well-bracketed with the safety, so he leads Celek up-field with his pass and puts it over the defender's head into Celek's arms before the safety closes for a big gain. These throws represent a snapshot of Garoppolo's overall accuracy grade and I think it's well-earned for a quarterback to finish 11th overall in just 5 starts with marginal offensive talent around him. Having a functional quarterback who understands leverage the defenders use in certain coverages and who can exploit that with his quick release makes for an effective and accurate passer. In part 2 of this series, we'll break down Garoppolo under pressure to show how and why he was successful.